The very nice thing about teaching is that I always get two periods of the year which are about new things and feeling optimistic about the time ahead. This time of year is one of my favourite – from a work point of view things are getting quieter, my lovely garden is starting to look beautiful again with lots of new things blooming every day. The camping and re-enactment season has started (hurrah!) and hopefully I will feel much better in time for the next event. September is also a lovely time as that is when all of the new students start and that is again a very optimistic time – for me and for them so I really look forward to that, This September will be very special for us as Jake will be starting sixth form and Ellie will be starting her second (!) year of Uni. We have also got some new beginnings in our family as my cousin Joanne had a baby girl yesterday so I would like to send big, big hugs to her, Tom (the proud dad) and Elan (the proud big brother). The baby has not got a name yet but will have a cardigan soon as I cast on last night for the little wrap cardi I have been waiting to knit for her, the yarn is Debbie Bliss Sublime again and the pattern comes from this book Cool Knits for Kids by Kate Gunn and Robyn Macdonald which I got as a nearly freebie from my Let’s Knit magazine a little while ago (just had to pay for postage). 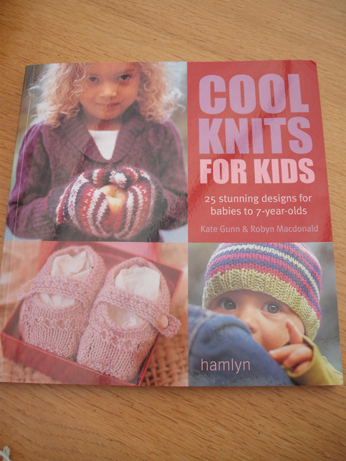 Lots of lovely knits in here for birth to 7 years old - should keep me busy for the new babies for a while! This is the cardi pattern …. 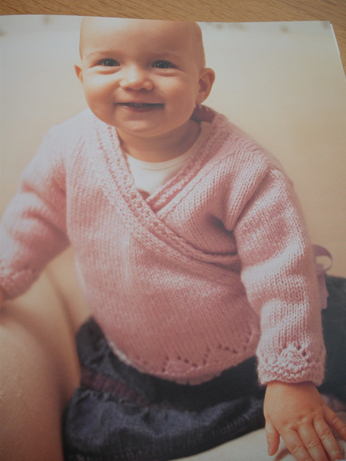 Pic from book - not pic of actual new baby in cardi! 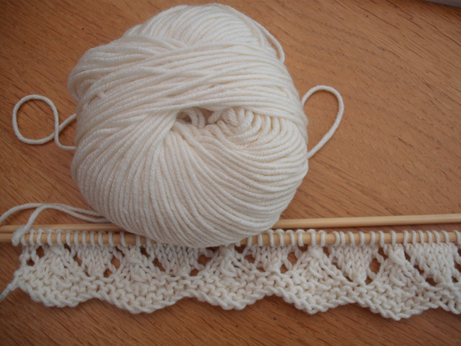 Look lace again - I can do this now! I took the above pic this morning and have already finished the back so it should be a quick knit though work will stop play once we finish having the lovely Bank Holiday weekend! 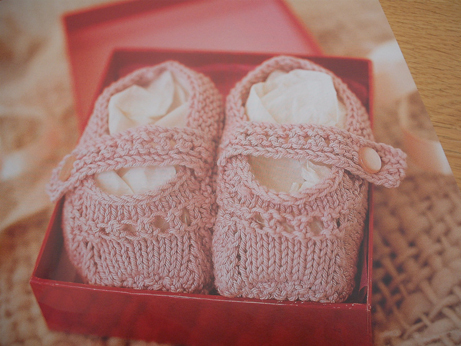 I am planning to make these bootees as well to go with it. I have finished the lacy scarf and am about half way through the Quaker piece for the raffle so the crafty weekend is going very well. 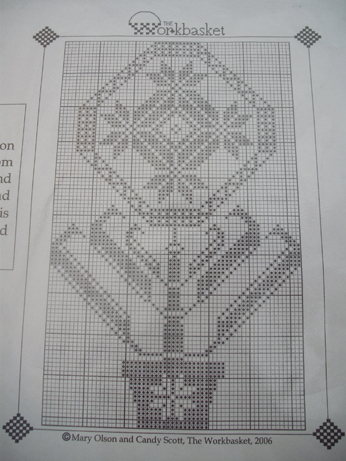 The design is called Quaker Flower and is freebie from The Workbasket site. 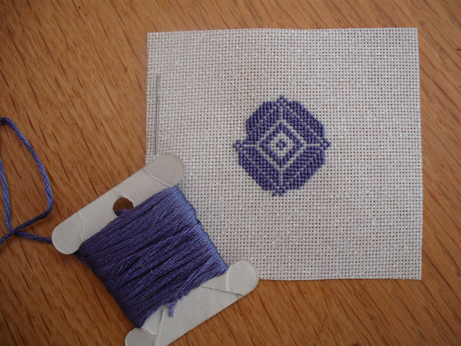 I am modifying it as it is going to be a scissor keep so am only stitching the top motif on my favourite sparkly evenweave with Silk Mill lilac thread. Hope you are having an equally lovely time.